It was the ultimate romantic gesture – spontaneously coiling a bar of silver around a finger as an engagement ring. That day in 1985 remains etched in Diane Venet’s memory as it was the day her husband-to-be, world-renowned French artist Bernar Venet, proposed to her with the first jewel he ever made, in a style characteristic of his art – an act that triggered her enduring love affair with artist jewellery. He went on to gift her pieces made by his own hand when developing a new concept for a sculpture or those created especially for her by his artist friends Arman and César, which led her to research the little-known world of these objets d’art. Acquiring only jewellery by painters and sculptors – never photographers, designers or architects – she has amassed a blue-chip collection of approximately 200 pieces by 152 of the world’s greatest artists of the 20th and 21st centuries whom she admires, such as Pablo Picasso, Alberto Giacometti, Claude Lalanne, Niki de Saint Phalle, Takis, François Morellet, Carlos Cruz-Diez, Louise Bourgeois, Antony Gormley, Anish Kapoor, Jeff Koons, Miguel Chevalier, Jacques Villeglè and Orlan. Foglia (2011) necklace in bronze and yellow gold, by Giuseppe Penone. While Venet considers artist jewels to be miniature artworks with profound meaning rather than jewellery, as you can recognise an artist’s signature style, it isn’t simply about shrinking a large-scale art piece, since wearability has to be considered as well. Echoing the same formal language, and sometimes humour, of an artist’s oeuvre, it allows the confrontation of new constraints in terms of size, weight or material. In a class of its own, it questions the meaning and function of jewellery and cannot be qualified as haute joaillerie, contemporary jewellery by an independent creator, costume jewellery or a mere accessory. Defying the conventional rules of jewellery, value is derived not from the use of expensive precious stones or the carat size, but from the reputation of the artists and their concepts, the rarity, originality, craftsmanship and provenance. Clockwise from top left: Ligne Indéterminée (2010) ring in gold, by Bernar Venet; Brown Nana (1973) brooch in gold and enamel by Niki de Saint Phalle; Untitled (2010) ring in gold, by Frank Stella; Modern Head (1968) pendant and brooch in enamelled metal, by Roy Lichtenstein. Prices can range anywhere from hundreds of dollars to hundreds of thousands. It is only in recent years that these tiny marvels, formerly in the hands of their original owners, have been appearing at auction houses, galleries and fairs. The advantage is that they are more affordable than a painting or sculpture and present the perfect opportunity to acquire a piece by a master at a lower price. You can find, for example, a Claude Lalanne butterfly brooch for an estimated €1,500 to €2,000, a Salvador Dalí pendant for €4,000 to €5,000, and a César compression for €6,400. Inclusion (1972) pendant in polyester, with a gold frame and watch parts, by Arman. Instrumental in raising the profile of artist jewels and creating a market for it, she is on a mission to share her passion internationally, having exhibited her collection since 2008 in Roubaix, New York, Athens, Valencia, Miami, Seoul, Venice, Riga and, most recently, at the Musée des Arts Décoratifs in Paris. The last, titled From Calder to Koons, Jewelery by Artists, showcased 260 works (80 percent from her collection and the rest on loan) and was the largest show of its kind. Venet sources her collection at auctions and a handful of galleries, such as Elisabetta Cipriani and Louisa Guinness in London, which released the book Art as Jewellery: From Calder to Kapoor last year. She has also bought pieces by artists such as Jean-Luc Moulène, Claude Lévêque and Phillip King from Galerie MiniMasterpiece in Paris, which was opened by her eldest daughter Esther de Beaucé in 2012, and is dedicated to limited-edition artist and designer jewellery, some of which are commissioned, that range in price from €350 to €35,000. 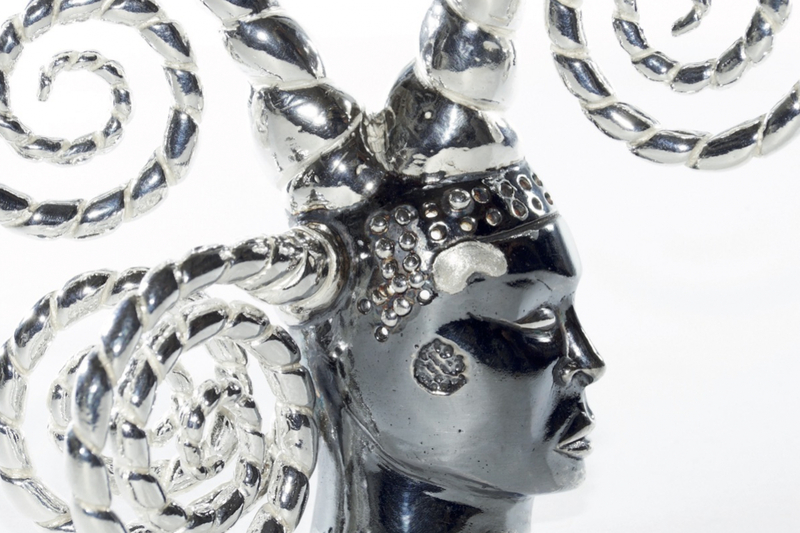 Although artist jewellery remains a niche market, attracting connoisseur collectors, it has come to the forefront also thanks to blockbuster exhibitions such as Medusa. Presented by the Museum of Modern Art in Paris, it united over 400 jewels by artists, designers, contemporary jewellery-makers and high-end jewellery brands, and anonymous, ancient or non-Western pieces. Helping to raise the profile, too, are specialised sales such as Christie’s 2017 Art As Jewellery online auction. Top figures achieved at auction in recent years include US$1.985 million for a 1940 silver necklace by Calder, US$1.055 million for Dalí’s The Eye Of Time brooch and £584,750 for Picasso’s Portrait de Dora Maar ring. Venet often collects one-off or highly limited-edition pieces, sometimes created by the artists themselves and other times, by jewellery-makers based on the artists’ sketches. The Hera brooch, for instance, was the first in an edition of eight designed by Georges Braque, who in the last two years of his life designed jewellery and had more than 110 gouaches transformed into jewels. The gold brooch embellished with blue sapphires and diamonds was produced by famous jeweller and lapidarist Heger de Loewenfeld. The Pol Bury gold bracelet manufactured by Italian jeweller GianCarlo Montebello, too, was realised in an edition of 25, while the Optic Topic domino mask in perforated gold conceived by Man Ray – incidentally also fashioned by Montebello – is one of only 100 pieces produced at the time. Venet also has in her possession the Madame pendant by Jean Cocteau, numbered 18 out of 50 and depicting the contours of a human face in fine lines of gold set with rubies and diamonds, and a unique piece by Wim Delvoye, comprising eight gold ring-pendants and a chain, that illustrates eight versions of Christ on a crucifix. From Calder, the most prolific creator of artist jewellery who made over 1,800 jewels himself, Venet owns a one-off gilded bronze belt buckle-pendant he crafted. Montre Petite Cuillère (1957) hair brooch in gold with night-blue enamel, by Salvador Dalí. In a way, her collection constitutes a diary of her life and friendships in the art world. Her first purchase before officially starting her collection was a Roy Lichtenstein pin she bought as a student in 1968 for US$3. Her oversized Elisse Concetto Spaziale lacquer bracelet pierced with tiny holes by Fontana, which resembles his Spatial paintings, was a birthday present from her husband. She also recalls how she obtained a Frank Stella gold ring with curved forms. A dear friend, Stella had at first refused to make her a jewel even after Bernar had attempted several times to persuade him, repeatedly saying: “I’m not interested. I do big things. Jewellery is not at all my thing.” Then, at a dinner in his New York studio in 2009, he pulled out from a drawer a necklace inspired by his relief sculptures, badly wrapped in a page torn from an old magazine, and offered it to her. She then went on to convince him to work on a small edition of jewellery and helped him settle on the design of his ring. Her latest acquisitions are a bracelet by Pablo Reinoso and a gold-plated dried sprouted potato necklace by Jacqueline de Jong. One of her most prized possessions, which she had spent years searching for, is Dalí’s Montre Petite Cuillère, a surrealist enamel hair brooch that’s at once a spoon, comb and watch. It was conceived as an edition of six, although she knows of only three pieces.